For anyone who thinks that animals can’t feel strong emotions like love and happiness, this video proves beyond a shadow of a doubt just how wrong that sentiment is! After a pretty intense birth, this mama dog was completely exhausted. As her little puppies all squiggle and squeal for some milk, the only thing this poor mom can do is lie on her side and hope to fall asleep. Though her puppies all came out healthy, she can barely move. But just when you’d start feeling sorry for this new mom, it’s worth waiting to see what Dad does! Softly and with obvious affection for his wife, he slowly licks at her face to help her feel more comfortable. As the babies all get something to eat, Mom and Dad get to share this beautiful and peaceful moment with each other. 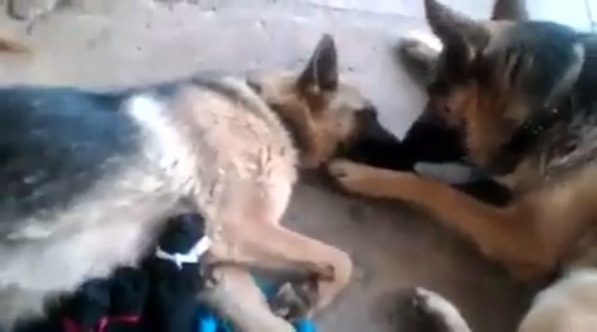 It’s hard to believe that anyone could possibly think that dogs don’t feel love for one another, but after watching this video, it’s pretty hard to stick to that idea. This father clearly loves Mom, and will probably do anything to make sure she and his brand-new babies stay absolutely and completely safe. It really doesn’t get much more perfect than this. Once Mom has gotten some rest, she (and her beautiful babies) will all be taken inside for a more comfortable place to sleep. Responses to "Father Dog Tenderly Licks His Mate After She Gives Birth To Puppies"